From Nelson Mandela to Stringer Bell to Commandant in Beasts of No Nation, Idris Elba has tackled some powerful roles. The British actor talks to CBC's Wendy Mesley about complex characters and that 007 kerfuffle. Forget about this whole "street" business: Idris Elba's got range. Just two years ago, Elba was earning praise for his film portrayal of anti-apartheid icon Nelson Mandela. Now, the accolades are rolling in again, this time for portraying an altogether different type of leader. In Beasts of No Nation, he plays a villainous West African commander who builds an army of child soldiers by molding them with equal doses of fatherly affection and horrific abuse. "Other side of the spectrum," Elba concedes with a laugh when asked to compare the two roles. "I think that in the span of a career of an actor, it's important to have everything," he told CBC's Wendy Mesley in Toronto earlier this fall. "Nelson Mandela is an almost god-like character, so playing him was like, 'Where do you go from here?'" Will the image of James Bond ever be shaken, not stirred? The choice to take on the role of Beasts' Commandant appears to have been a good one for Elba. Based on a novel by Nigerian author Uzodinma Iweala, the Netflix movie – a first for the streaming service and available Friday – is already earning Oscar buzz. 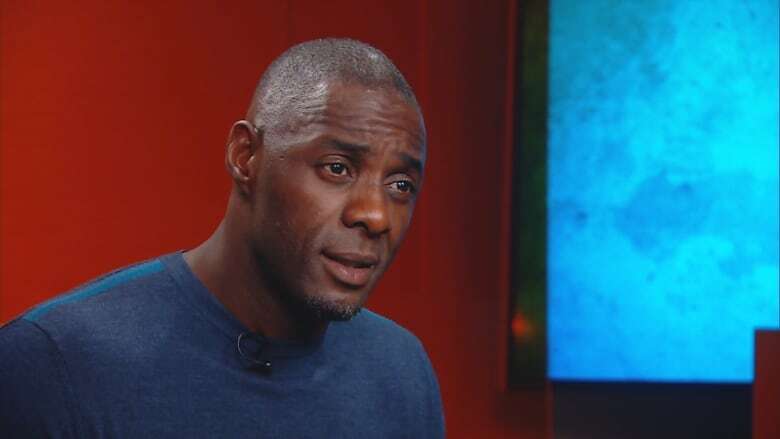 Elba has stated that the role has allowed him to explore his own West African heritage but rejects the idea that he is trying to tell "black" stories. "The characters I have managed to play have complexities," he said. "Human complexities. Not necessarily black [complexities]." "Of course, I'm a black man and I play black characters. But that's not necessarily the experience that you get from the character," Elba continued. "I think that's the future of filmmaking when you talk about diversity." And how does Elba respond to the tempest surrounding author and fellow Brit Anthony Horowitz's comment that he is "too street" to play James Bond, a quintessentially British character? It was widely construed as a thinly veiled racist remark. Shifting back in his chair, the actor clearly wasn't too keen on the question. "If I'm honest, I'm like on a 19-hour day and I hear that and it doesn't change my life," he said. Still, he addressed the controversy, musing "What does the word 'street' mean? "It's a stereotype and so on and so forth. Of course it's going to be shocking. But like I said, from my perspective, everyone has a nose and everyone has an opinion." "I'm definitely from the street," Elba said. Watch an excerpt of Mesley's interview in the video above or tune into Friday's The National for the full interview.